What’s your Bailiwick? For J.C. and Jeff Smith, it’s making a classic clothing line that taps into the pride of their adopted hometown. 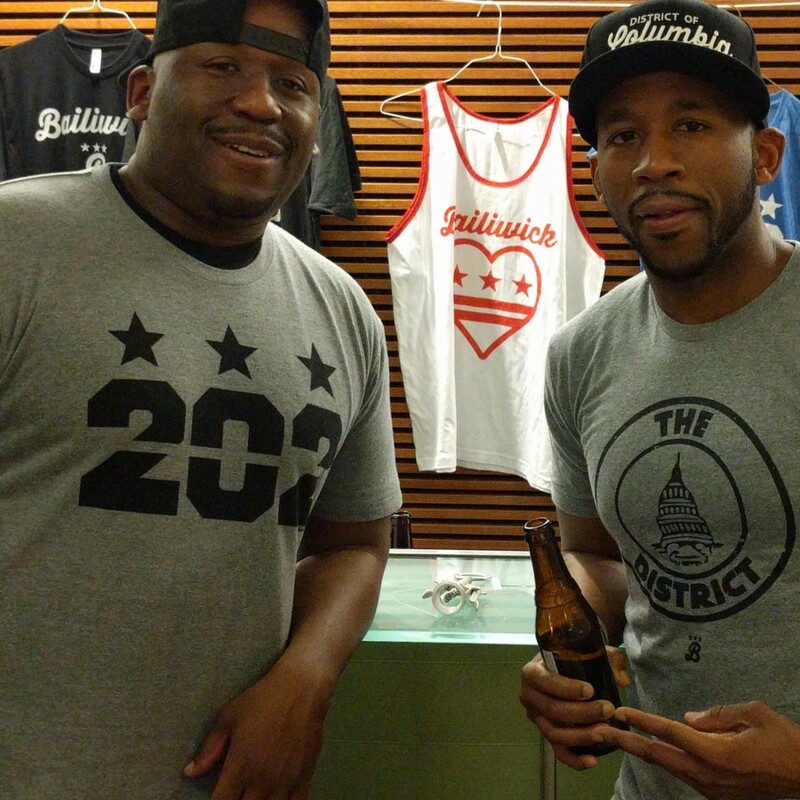 “Being in Washington, D.C., it would’ve been easy to be a t-shirt company for tourists. But we didn’t want to do that. 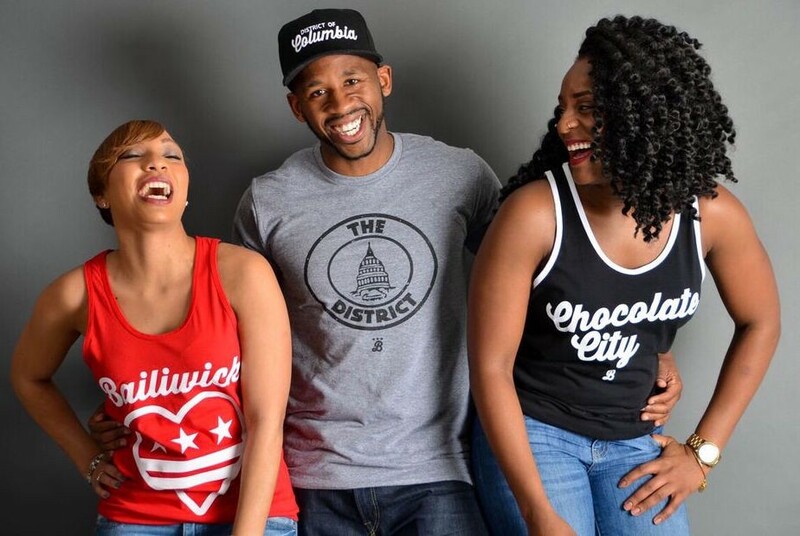 We didn’t want to be that,” said J.C., “We wanted to tap into the pride that the residents have and make a shirt for D.C. that went beyond a team shirt.” And with growing sales and an expanding product line, the brothers seem to have done just that. 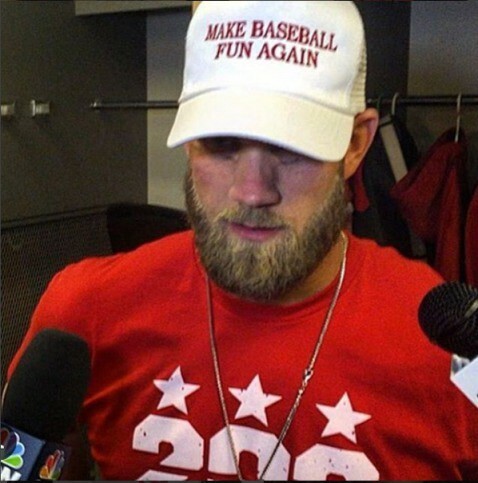 It also doesn’t hurt that Bryce Harper, one of the area’s highest profile athletes and a fellow D.C. transplant fond of his second home, wears the company’s t-shirts. What was the inspiration behind Bailiwick Clothing Company? About 10 years ago, my brother Jeff and I — we’re a two man team — were living in Boston. We’re originally from the Cleveland area but had moved to Boston for work. A t-shirt company back home had a contest to design a t-shirt. We entered the contest and won. The design became their next great t-shirt design. They ended up selling tens of thousands of that shirt with our design, and all we got was a free t-shirt and a couple of stickers. There was some gratification to that, but it was frustrating to see them have all that success with that shirt and to not be a part of it. But that experience planted the seed that this was something we could do ourselves. Fast forward a couple of years and now we’re living in D.C. We saw that there was a void in D.C. to find cool shirts and clothes that really represented D.C. and were not a team shirt — not the Nationals or the Wizards or the Caps. We wanted shirts that connected with the soul of the city; it was something we always had in our minds and that we thought we could do. How are things going with the company? We’re just enjoying the ride right now. It’s going great. I’m not going to lie. Since the latest Bryce bump, things have been great. We were doing well before that, but he just helped take it to another level. We’ve only been a company since January 2015 and have been online since March 2016. So we’ve been growing pretty quickly and things are on an upward trajectory. When we sent the shirts to Bryce in Spring Training, it was a little bit like a kid writing a letter to a baseball player. You don’t really expect to hear anything back. Except he wore them, and the fact that he’s worn multiple shirts of ours is really cool. It’s been awesome. He’s a big ambassador for D.C. and for the brand. What does “Dedicated to D.C.” mean to you? It’s kinda funny, because we’re not from D.C. And oftentimes we do get flack from locals for that. But what I tell them is that we chose D.C. We weren’t born into it. It wasn’t an arranged marriage. We chose you. We chose D.C. as our prom date, so to speak. What Dedicated to D.C. means to us is that we live here, we shop here, we bank here, we try to keep our money here. We try to do everything that we can for the company here in D.C. We love it here, we’re here to stay and we’re trying to help shine a light on the city and on other people in D.C. who are doing great things. That’s part of our “Strivers” section, which you probably saw on our website. We ask local artists and creatives different questions about their craft, about D.C., and find out what makes them tick. It not only promotes the artists but also all the great things that D.C. has to offer. And that’s special to us — the great food scene, the great music scene, the great creative scene — and it’s represented in the shirts and the clothes that we do. Where do you get the inspiration for your shirt designs? We get it from a lot of places. If you look, we get a lot from the symbols and the signs that you see around DC. Obviously the 202 design comes from the flag. 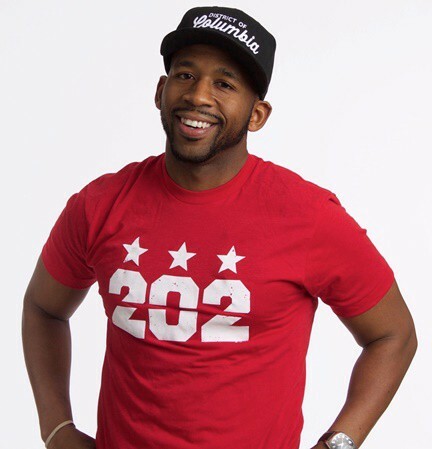 The D.C. Bailiwick shirt comes right from the Anacostia Freeway 295 sign. So we keep our eyes open when we’re in different parts of the city. We look at the buildings and the culture and get inspired by that. And then, honestly, we get inspired by the people of D.C.
Bailiwick designs draw on the history and imagery of Washington, D.C. I also get inspired when I run. I just run around the city. I go run Capitol Hill, I go run downtown, 14th street, go to Meridian Hill Park, and sometimes even Georgetown if I’m feeling ambitious. I keep my eyes open and I look at everything. I also talk to people that have been here for a while. People that can tell us what D.C. used to be and tell us the great stories of D.C.
Another big thing we do is spend a lot of time looking at the history of D.C. on blogs and websites. I’ll give you a quick second here to promote somebody else: Her name is Shellee Haynesworth, and she runs a blog called Black Broadway on U. As I was saying, I’m not from D.C. so one of the things I wanted to do, and Jeff wanted to do, is to be true to the history. So we wanted to study it and find out all about the past. Ghosts of D.C. is another website with some really cool stories about the past and how D.C. started, and some really cool tidbits from old D.C. We also go to the library, as crazy as that sounds. So as much as we derive our brand from music and from the current scene, we also derive a lot from going old school. It’s great to see star athletes wear your clothes, but it seems you’ve tapped into something deeper with D.C. pride. Tell us about that. It’s funny because it seems like in the years that I’ve been here, D.C. pride is at an all-time high. You see the flag flying a lot more places, you see a lot more businesses incorporating the flag. It’s one of the most beautiful and recognizable city flags that I know. There is just so much pride going on here. People are starting to realize this is a top-notch city and it’s not just politics. We’ve been able to tap into that feeling. For the people who are new here, we try to show them that this is something that can connect you to D.C. But for the old timers we want to show them that even though we’re new in town, we get it and that we’re part of it and we have that D.C. pride too. One thing that Jeff and I always talked about when we were starting Bailiwick is that we didn’t want to be a company for tourists. We made that a conscious decision. People tried to convince us otherwise, that we could make a lot of money selling t-shirts to tourists. But we didn’t want to do that. And we still don’t want to be that. We want to tap into the pride that the residents have. Anyone can sell a touristy shirt. We’re trying to come up with designs that speak to a deeper message of D.C.
You’re part of a growing entrepreneurial community in Washington, D.C. What makes this such a great place to start a company? The creative community in D.C. is really supportive. The folks that I have met here — even the other t-shirt companies, who are my direct competitors — we meet up and talk about things. It’s always a really cool vibe and a vibe that we’re all growing together. And we all realize that there’s enough opportunity here for us all to eat at the table. The relationships are friendly and we’re genuinely happy for each other when we see each other succeed. Another good thing is that the Made in D.C. legislation has really taken hold. And people all over feel like this is a place where they can come and get the resources, training and support that they need. So you’re seeing new businesses all the time. You even have new distilleries starting up, like Green Hat Gin and One Eight Distilling, and they’re having a good time. The food community is really doing it here and there’s so many new chefs. I can go on and on. There’s a huge influx of young people here in D.C. that aren’t scared to start a business and the community is supportive. Any advice for your fellow entrepreneurs? The first piece of advice that I would give them is don’t wait. Jeff and I, we waited. We probably had the idea for Bailiwick for five years. We had the idea, we had the name, we had some of the designs. We had everything. But we’re all super involved in the community, have families and had day jobs. And we just said we’d get to it, and all the while we could’ve launched this thing and been selling. We’re in a good place now and we’re happy with what we’ve accomplished, but I’d tell them to go for it. If you have a great idea that you like and you’re passionate about it, go for it. Because you never know what will happen and you don’t want to have regret that you could’ve started earlier. I’d also say tap into the resources that are available to you. Tap into Made in D.C., tap into A Creative D.C., the D.C. Small Business Development Office. They’re always looking to help people out there. Avid homebrewer, distance runner, sports enthusiast and tech geek. Dedicated husband and father. Native Washingtonian. Tweets are my own.